Taking into account the two countries effective legislation, mutual respect and common framework for action, Jaunpils county council chairman Ligita Gintere and Moldovan municipalities: Andrusul de Jos Mayor Gheorghe Pralea, Radeni Mayor Petru Rabdau and Festelita Stefan Vodă mayor Nicolae Tudoreanu signed twinning agreements to develop cooperation in various fields of interests. Every year on November 11 Latvians mention Lacplesa day. Throughout the Latvian is lit dozens of candles to commemorate the Latvian national army victory over the West Russian Volunteer Army, the so-called Bermont troops on 11 November 1919. To commemorate this event, Lacplesa day is honored Latvian freedom fighters. With torches and candles in the hands, Jaunpils people gathered together and went to light walk. After that everyone could watch outdoor cinema film "4x4 for freedom" premiere. It is very important for all of us, and trough that tradition we can teach our kids and youth about our history. This award is one of the ways that Tourism Association of Kurzeme can say thanks to the tourism sector workers for their contribution to the Kreme region's image and development of tourism. The 21 st of June in Latvia is known as a Summer Solstice and Plant day -when all meadow plants and flowers have very special power-the power of nature. That day in holiday house „Vagas” Arta Berezovska opened for public her long awaited project-The garden of natural life of herbs. As tells the housekeeper Arta, it shows not only the various species of herbs, but this garden is like an adventure, which will be a sustainable project in constant development in the future. Now it is just the beginning and plants are organized according to their blooming colors and seasonally it possible to identify the color of the garden squares. The opening event of garden in 21st of June 2015 with exercises of Ci-gun by instructor Rita Grīnfogele and the fire ritual. Latvian School Youth Song and Dance Festival is the biggest Latvian children and youth culture and arts festival, which takes place every five years in Riga. Children and young people are the ones, which confirm that the ancient Latvian singing, dancing and musical traditions are continued and held in honor. With song and dance festivals for children and youth-related artistic creation takes place and collective cultural circles - choirs, dance groups, brass bands, small music collectives, folk music ensembles, visual and applied arts as well as theater and art collectives of children and youth folklore groups. This year between the 38000 pupils were also Jaunpils secondary schools’ choir (Master Mrs. Kabaka) and folk dancers (Master Mrs. Liepiņa). In 2012 Jaunpils Municipality joined to the Newcastles of the World Alliance. Chairwoman Ligita Gintere signed the 2012 Newcastles of the World Joint Declaration in Newcastle upon Tyne United Kingdom. Long –awaited and long cherished book about Jaunpils history now are in our hands. We are very proud of it. Almost 20 years Inta Dislere together with Jaunpils museum specialists Ligija Rutka and Zinta Arika was working on this book. They worked in archives, libraries, museums in Latvia and abroad, collected people memories, gathering together photos etc. This is a true story, based on the real historical facts, documents, trough 700 years-from the 13th till 20th century. This historical research is unique. Like a Christmas gift for local people, the book –more than 400 pages and 200 photos -celebrated its opening event by the end of December. The book is financed by Jaunpils Municipality Council. Special thanks for Ligita Gintere, Chairwomen of Council. If you are interested in history, you can buy the book in Jaunpils museum. Senior people are very active in our municipality. In 2010 they founded seniors association “Jaunpils”. Seniors led by Mrs. Austra Sipeniece, organize culture and healthy lifestyle activities. Seniors enjoy sport activities, especially Nordic walking and line dancing. They also organize different events, excursions, experience exchange tours, develop knowledge in psychology, improve language skills etc. in lifelong learning courses. Seniors association support preservation of culture traditions. They participate in various projects -at the moment they are working on the project, which will be important for all citizens in our Newcastle. One of their member Mr. A. Lacis have saved produced short films by himself about local people, rural cultural activities, traditional celebrations, concerts in 70s and 80s. Now, by financial support from Newcastle Municipality and fund of Teterevi, seniors want to digitalize this material and make a film “This was our time”. It will be important for all generations –youth will see how the life in Newcastle was for more than 40 years ago, medium generation and seniors can organize memory evenings and discussions about life now and then. September 27th was an exciting day for all 230 students. Jaunpils Secondary school participated in Olympic day 2013. Olympic day started with the Olympic morning gymnastics- specially set of morning exercises doing at the same time-at 10:00 o clock in 83 places all over Latvia. During the day students participated in relay races and other sport activities. The winner teams got the tickets to Riga’s “Dinamo” hockey game. Olympic day is the only global event organized by Olympic Committee and enhances to people Olympic values-excellence, friendship and respect. It’s also a great chance to remind our students and adults about healthy lifestyle. This summer from June 30th till July 7th 74 members of Folk art collectives – “Jaunpils” (Newcastle) choir, Medium-generation dance group “Jaunpils”, Youth dance group “Atsperite” (Spring), Vocal ensemble “Vocalica” and Applied art weavers collective from our Newcastle took part in one of the most noteworthy events in Latvia’s cultural life- XXV Song and XV Dance Celebration. This is a major event involving thousands of participants from all over Latvia. The festival features a number of various concerts and last for a whole week. They start with a song Celebration procession when the viewers welcome the participants, and end with a final concert at the “Mezaparks” open air stage with a concert of the 13000-strong joint choir. The Song and Dance Celebration has also been included in the UNESCO List of the Intangible Cultural Heritage of Humanity. The 1st September was the Day of knowledge in Latvia. All primary, basic, secondary school students, teachers and parents celebrated the start of the school year 2013/2014. This morning started with the ceremony, speeches by chairwomen Ligita Gintere and the head teacher of Newcastle Secondary school Mr. Janis Liepiņš. In Latvia it’s a tradition – students give autumn flowers- gladiolus, asters and dahlias to their class teachers. For parents, whose kids are in classes from the 1st- 4th, the 1st September is an official holiday. August 10th was an exciting day in Newcastle, Latvia. 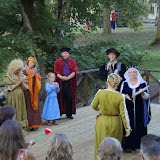 Local people and visitors celebrated medieval feast “Lords of manor marriage”. Visitors were welcome to participate in different workshops and various activities together with the castle characters - Bert, Hilda, monk Theodor. Craftsman and traders, the ancient music ensemble “Trakula”, folk ensemble “Putni”, ancient dance group “Calendula” and artists from Riga Circus entertained visitors. During this day every one had a chance to try shooting a crossbow and take part in tournament. Very interesting activity was the ax throwing. All together we had a possibility to become real medieval heroes. Late in the evening in the Newcastle’s yard event visitors continued to rejoice and dance all night long.